Beautiful Northern Cardinal/ Red Cardinal. Cardinal one of the most recognized bird in the North and South America. 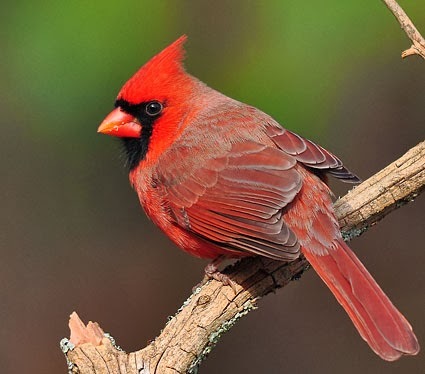 Even though there are many species of Cardinal, perhaps the most beautiful one will be the Northern Cardinal (Cardinalis cardinalis) for its bright red plumage. They also have something to offer instead of just beautiful appearances; their nice songs of calls – that totally will lift-up your moods. There are 19 subspecies of Northern Cardinal alone and there many other in same family. The names of the Northern Cardinal refer to the cardinal of the Roman Catholic Church, where the plumage color looks similarly to the red robes and caps. Northern Cardinal known as pet bird before it was protected by the ‘MigratoryBird Treaty Act of 1918, in the United States. 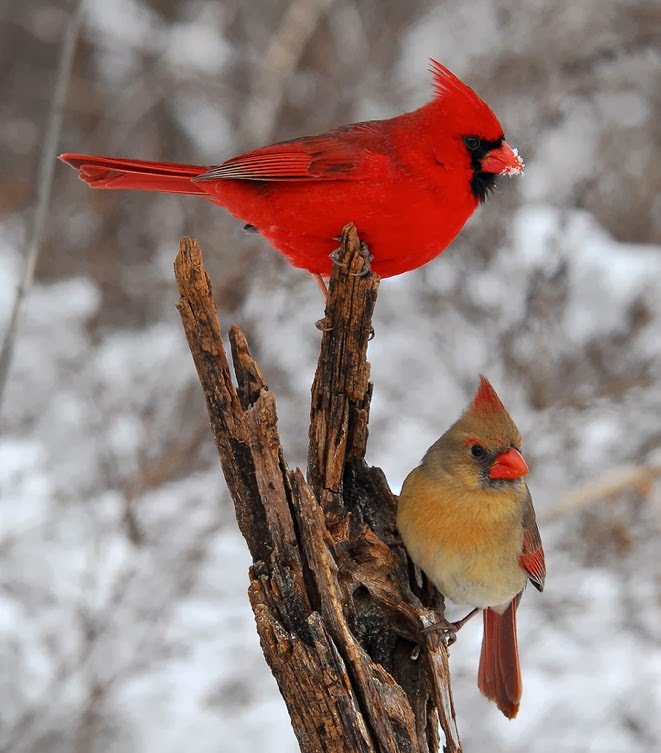 Pair of Northern Cardinal during winter. 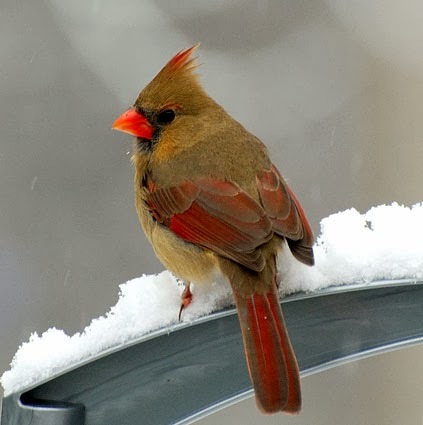 With the size can be 20-23.5cm (7.9-9.3 in) in length and a wingspan of 25-31 cm (9.8-12.2 in) the Northern Cardinal is not the smallest in its family. Their colors are mostly red and also some black and darker colors on the back and wings compared to the females that has mostly grayish-brown tones and a slight reddish tint on the wings, crest and their tail feathers. Northern Cardinal is very good in singing (they has a great songs). There’re numerous of Northern Cardinal calls and these calls also vary according to their region. There also different calls between male and females. You can find samples of their calls from some websites. Northern Cardinal feed the female beak to beak. 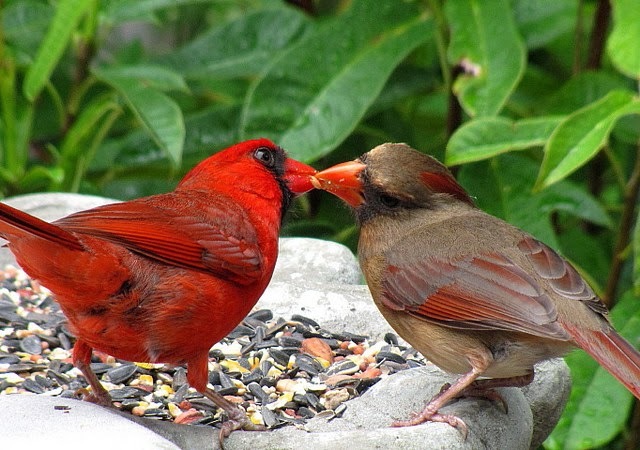 When it comes to family, Northern Cardinal will mate for life. They will shows such great behavior such as offering food by the male and feeding her beak to beak, travelling together and sing together too. What such a wonderful bird after all? For their diet mostly Northern Cardinal will prefer on seeds. They also prefer insects, beetles, cicadas, grasshoppers, snails, wild fruit and berries, corn and oats, sunflower seeds, the blossoms and bark of elm trees and maple sap. Their diets are mostly depending on the availability of the food source. Anyway Northern Cardinal always prefers to feed their young with insects. 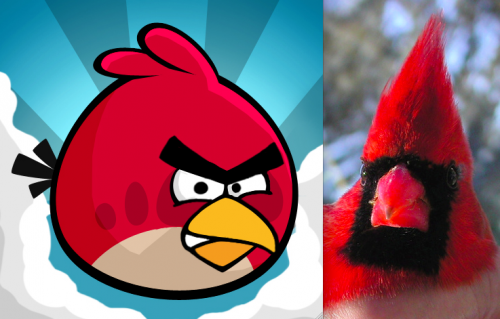 Northern Cardinal in Angry Bird. Northern cardinals are very popular to human. We can see it used in many logos, mascots and also in popular video games such as ‘Angry Birds’.